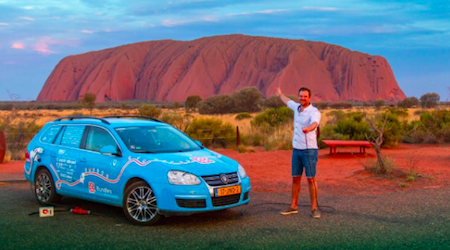 The only stretch on his trip from Amsterdam to Uluru through 33 countries where a Dutch adventurer needed a tow was the 255 kilometers between Glendambo and Coober Pedy. Wiebe Wakker covered the other 80,000 kilometres in his electric car, recharging it as he went along his “Plug Me In” journey which started on March 15, 2016, enjoying hospitality from more than 350 people who offered him food, shelter and – well – a powerpoint. His car, nick-named the Blue Bandit, has a range of 200 km. 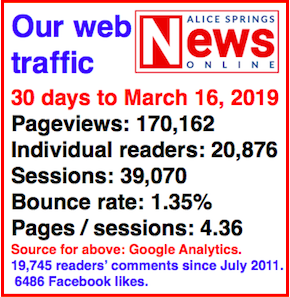 He is now on his way to Alice Springs, with Sydney as his final destination, having already crossed the Nullabor “which everyone assumed wouldn’t be possible in an electric car,” he says in a media release. Mr Wakker says he managed to cross Europe, the Middle East, India and Southeast Asia “without any money”. Would be a real accomplishment if the power he plugged into to recharge was actually renewable power. Most I suspect would have been fossil fuel based. So what precisely did it achieve, I wonder. Think I’ll wait for the hydrogen car. So he bludged on everyone else along the way and didn’t even bother to carry a small generator with him. Hardly proves anything except that he is not very bright.